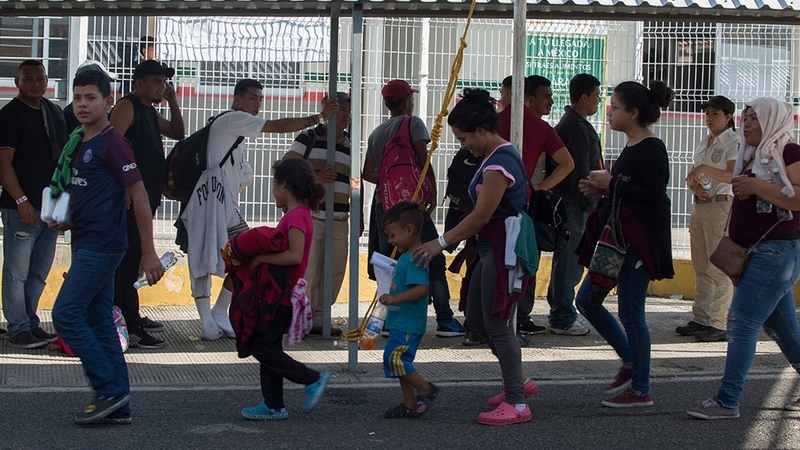 Part of the 700 plus South American migrants headed for the US arrived Thursday at Guatemala's border crossing at the Mexican frontier, according media reports from Mexico. A Mexican official told Fox News that they "did not want to confront" the migrant caravan, fearing the repetition of last year's incident where violent clashes between police and the migrants broke out. On Monday, the Pentagon announced it would extend the deployment of about 2,350 troops to the US border through to the end of September. The AP also says the latest caravan may be larger, with as many as 1,800 people joining so far. Numerous migrants are traveling in families, often with small children. But numerous migrants were still travelling through Guatemala, and it was hard to say how big the caravan would be once it began making its way through southern Mexico. Our goal is to reach the United States, ' said Alma Mendoza, a nurse and single mother making the trip with her three children. 'My goal is to reach the United States, but if I can't I'll stay in Mexico and work. This caravan left on 15 January 2019 from San Pedro Sula's Central Park. "The road today was open", said Marco Antonio Cortez, 37, a baker from Honduras traveling with his wife and children, ages 2 and 9. In a radio interview, Mexico's National Coordinator of Civil Protection David Leon said he did not have precise figures of the number of migrants that entered, but it was estimated to be about 800. U.S. President Donald Trump warned Tuesday of a "big new" group of migrants coming to the U.S. from Latin America, adding that the newest caravan is coming from Honduras where rampant gang violence and poverty has led many people to leave their countries for the U.S.